The paved Vail Pass Trail spans just over 8 miles, following the original Highway 6 route from Gore Creek Campground in East Vail (at the end of the Gore Valley Trail) to the summit of Vail Pass at 10, 662 feet. 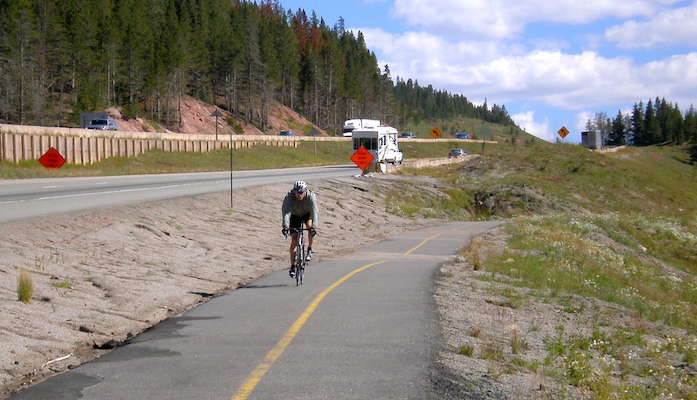 From there, you can add on more mileage on the TenMile Canyon National Recreation Trail. The entire trail is 13.5 miles between Gore CreekCampground and Copper Mountain. In season you can catch a bus between the two. The lower parts of the trail have more open fields and great views. Note: this is a hilly and challenging run! The elevation depends on which way you go. It’s a steady climb from the Vail end up to Vail Pass. More uphill on the Vail to Copper route than the Copper to Vail route. East Vail Bus to Main Gore Dr. / Bighorn Rd.